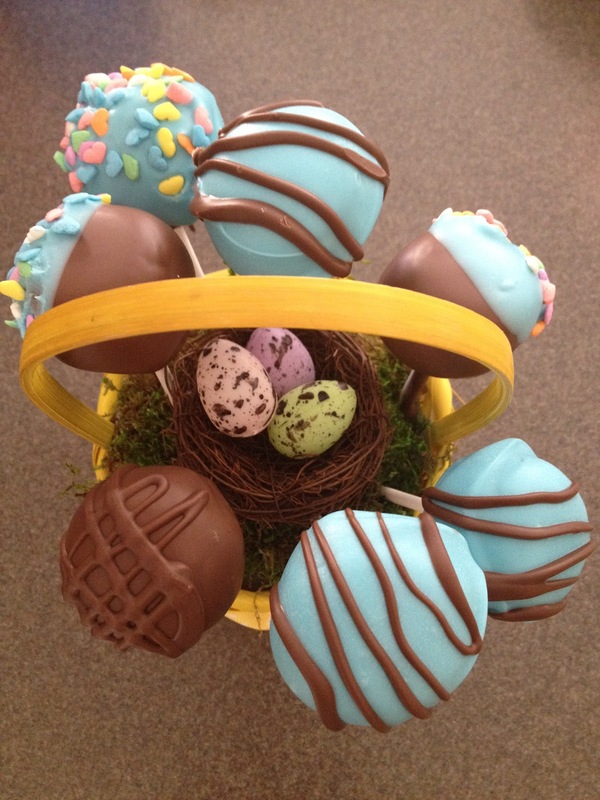 Here is a QUICK and EASY tutorial about Cake Pops..
1. Bake a cake in a 13 by 9in cake pan and let the cake cool. 2. Destroy the cake... spoon the cake into a mixing bowl and mix with a little less than one can of frosting. 3. When the cake and the frosting are well mixed, meaning the cake is MOIST and there isn't much of a bouncy bread look to it anymore, pick some up in your hands and roll it into a ball. If you roll balls the size of a quarter you can get about 45 to 50 pops out of your mix, if you roll them the size of donut holes, you'll end up with around 30. 4. 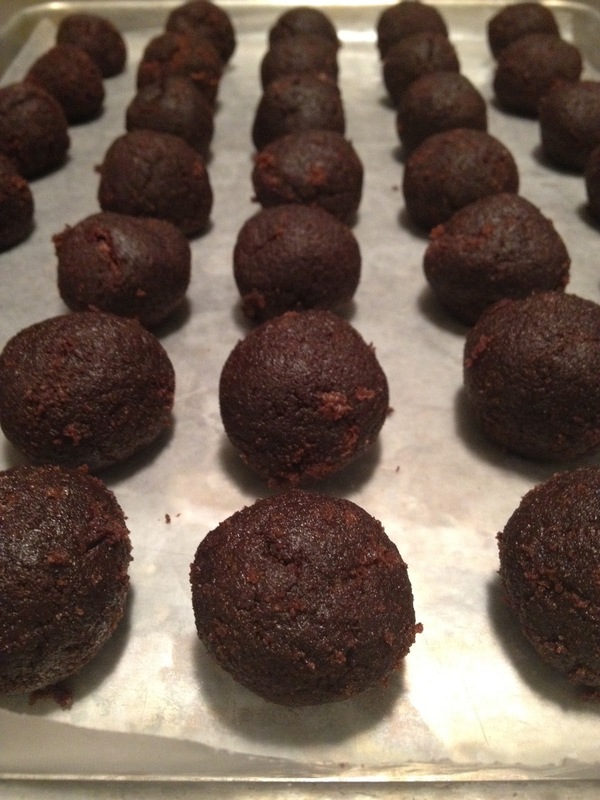 Place the rolled balls onto a cookie sheet lined with wax paper. Don't panic, you'll able to wash the sticky mixture off of your hands soon..just keep rolling. 5. When you're done, place the cookie sheet in your refrigerator for 30 min or your freezer for 10 minutes. 6. While the cake pops are chilling, melt a small amount of your chocolate or almond bark. You'll use this to attach your sucker sticks to the cake pops. 7. After the cake pops have chilled, dip your sucker sticks into the room temperature chocolate or almond bark and then insert the sticks into your cake pops. Try not to go through the bottom, but if you do, its OKAY. 8. 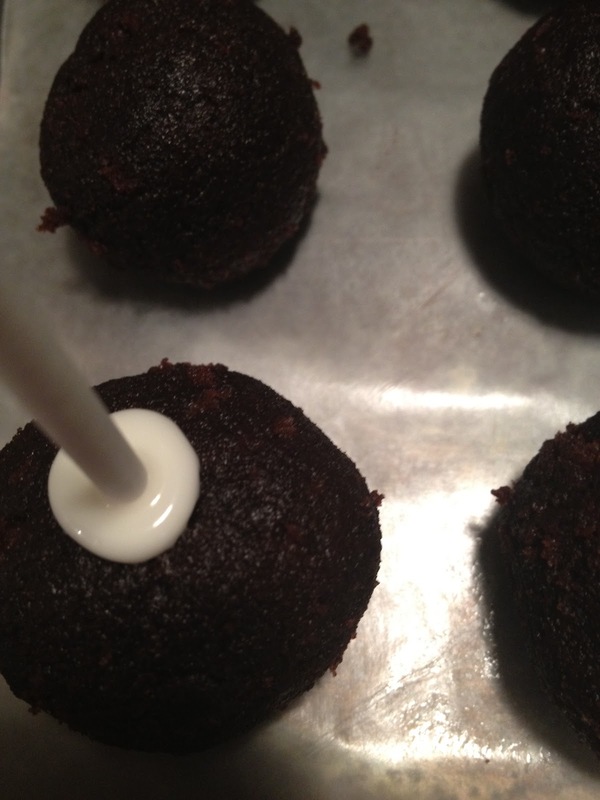 Put the cake pops back in your refrigerator for about 20 minutes. 9. While the sticks are setting up in your cake pops, melt your chocolate or almond bark. You'll use this to dip your suckers into, so melt quite a bit. Let the chocolate or almond bark cool to about room temperature before you begin dipping. It's best to melt your dipping chocolate or bark in a tall cup...it just makes dipping easier. 10. 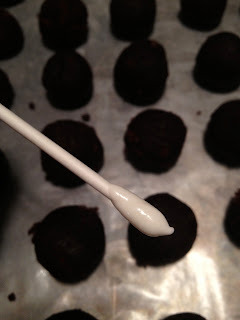 To dip the cake pop, tilt the cup nearly on its side and lay your cake pop in the chocolate or almond bark, lift and turn the cake pop, coating each side. (If you simply dip the cake pop straight down into your cup, suction will pull it right off of the sucker stick, sad but true). 11. After dipping, hold the cake pop straight up and allow any excess chocolate or bark to drip off. 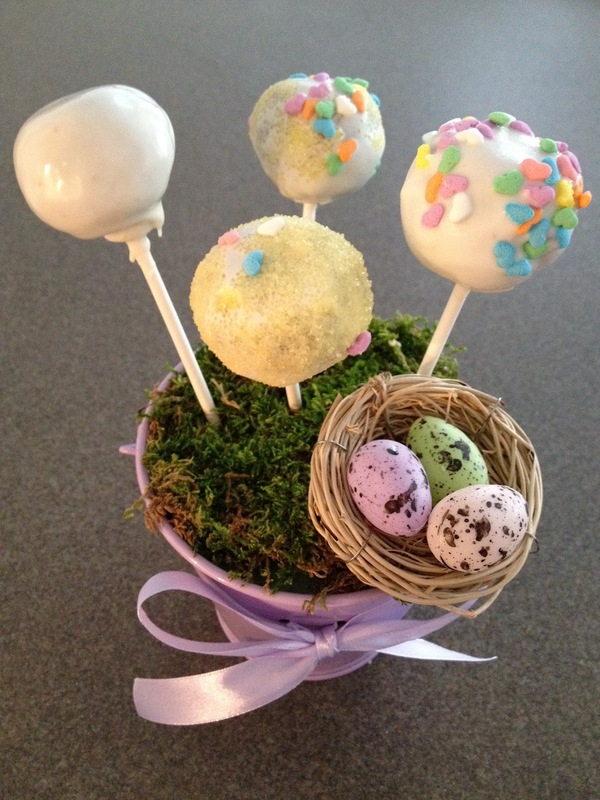 Then place your cake pop in either a block of styrofoam or block of wood w/ precut holes to let it dry. 12. If you want to add sprinkles, don't let the chocolate or bark fully dry but wait until the major dripping stops. 13. If you want to drizzle or re-dip the cake pops with another color or layer of chocolate or bark, wait until the first layer is fully dry. 14. Set up the fully dried and decorated cake pops in an arrangement and ENJOY. If you want to make WHITE or light colored cake pops, use WHITE or a light colored cake mix. To drizzle the cake pops, mix a small amount of VEGETABLE SHORTENING in with the chocolate or almond bark. Separate your dough into two balls. 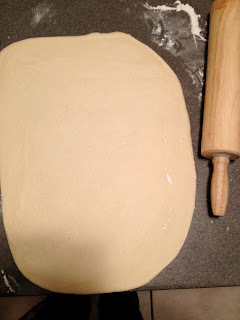 Roll out one ball of raw dough into the shape of a rectangle, with the longs side measuring about 12 inches or as long as your rolling pin. Spread spaghetti sauce on the rolled out dough and add diced spinach in a line down the middle. 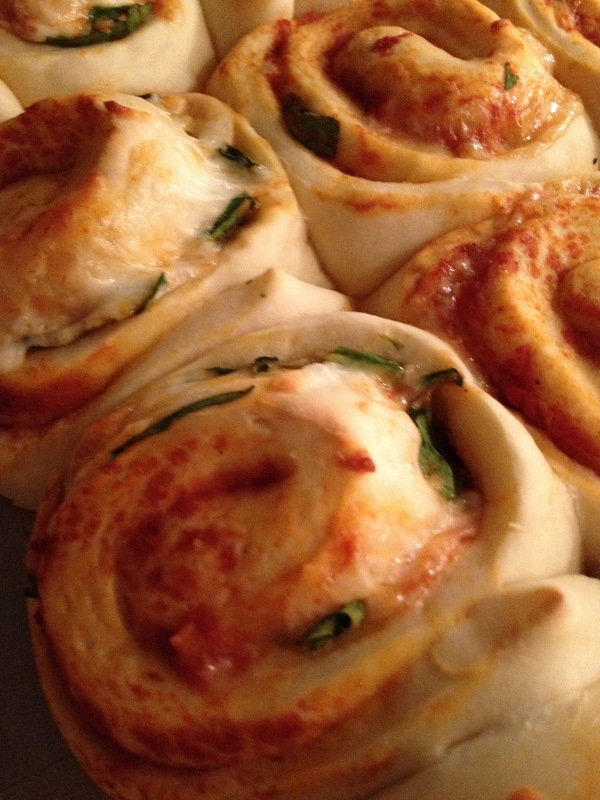 Sprinkle shredded mozzarella cheese down the middle of the dough, on top of the spinach. 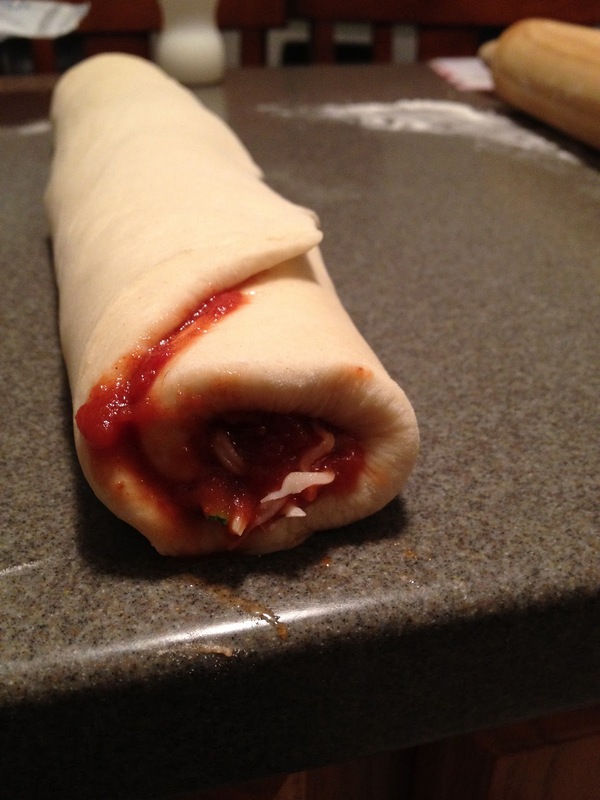 Now, roll the dough keeping the long edge long. Using a sharp non-serrated knife, slice the roll in the middle. 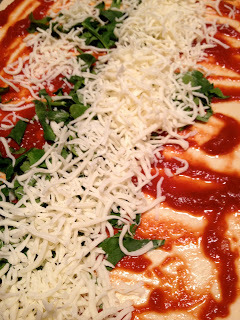 Then slice the two sides in their middle. Now you have four rolls. Slice each of the four rolls into three pieces. You now have 12 rolls. 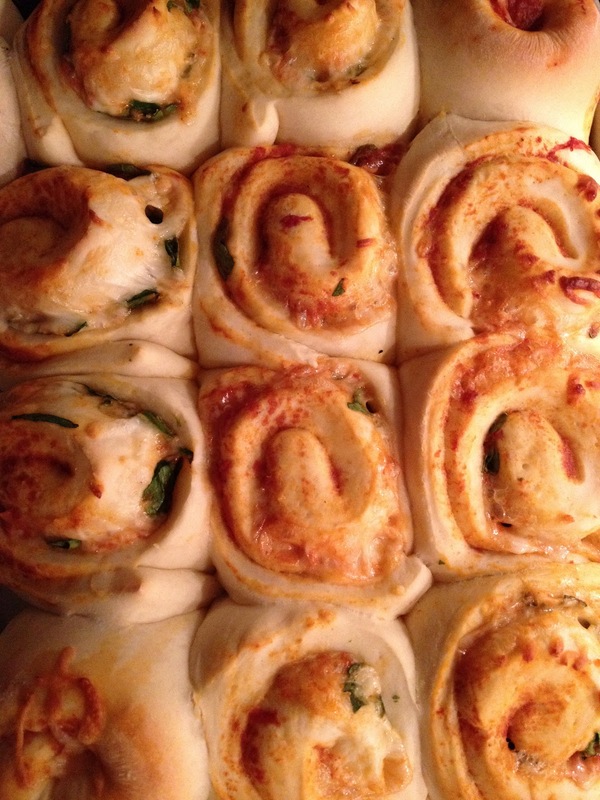 Place your rolls onto a greased cookie sheet and set in a warm place to let rise for about 20 to 30 minutes. I usually set my oven to heat up and place the cookie sheet on top of the oven with a dish towel over the rolls. Since these rolls are very moist they may not rise MUCH. Remove the rolls from your oven when they look buttery yellow, this dough recipe does not brown or get toasty...So you should only leave them in the oven for 10 to 12 minutes tops. If you want to use the second ball of dough to make cinnamon rolls rather than 12 more pizza rolls, roll the dough out into the same rectangle shape. Pour melted butter onto the rectangle shape and spread it from edge to edge. Sprinkle cinnamon and sugar onto the buttered surface to your liking. Roll the dough keeping the long edge long. 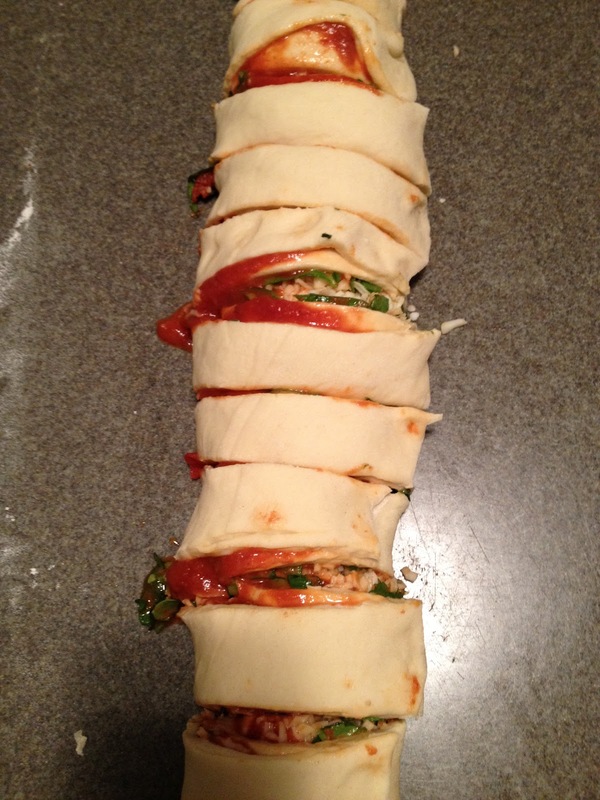 Cut the roll into 12 pieces and place those rolls onto a greased baking sheet. Let your rolls rest in a warm place and allow to rise for 20 to 30 minutes. Place the cookie sheet into a 350F oven for 10 minutes. Remove and let cool. Spread with icing (recipe below). I use a bread machine but I've also hand made this recipe. If hand making it, you would knead the ingredients above, let rest for about five minutes, knead it again until a good ball forms. 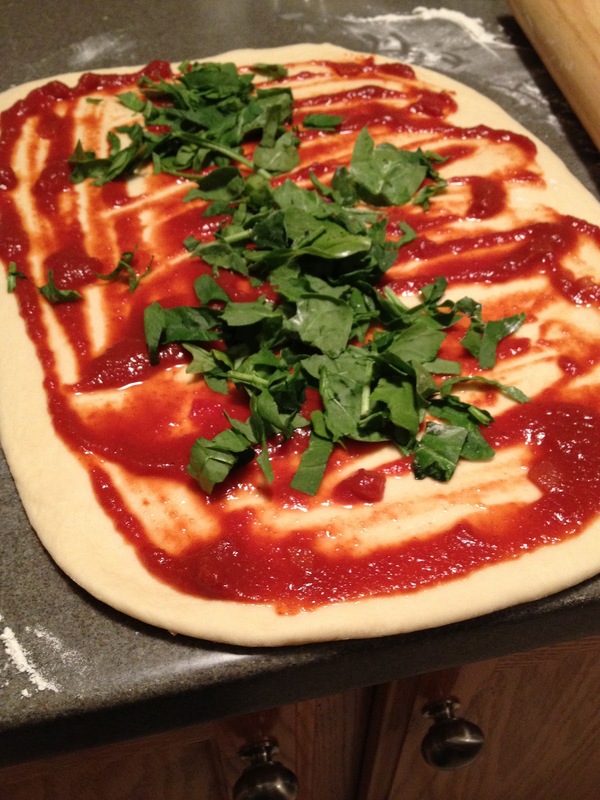 Cover and let the dough rest and rise for about an hour before separating the dough into two balls and rolling them out. 2 cups powdered sugar, or enough to make icing thick. Mix melted butter, milk and vanilla. Whisk in powdered sugar a small amount at a time to avoid lumpy icing. 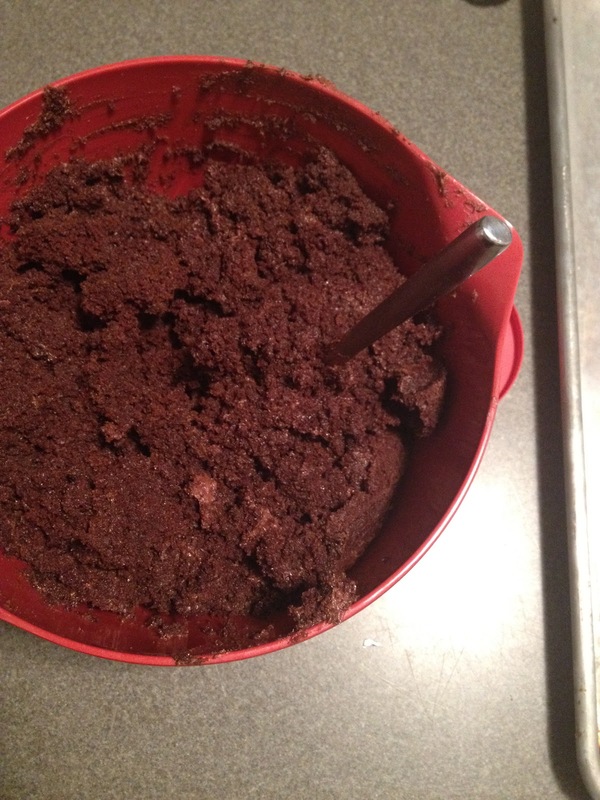 Mix until thick enough to stay on whisk or spoon when lifted from mixing bowl.